If you have been following along, you know that one of my big goals for this year is to update some of the recipes and photos from Cooking Quinoa. While we don’t eat quinoa much as a family anymore (thanks to five years of severe overload), I have had so much fun going back and re-making some of my favorites. It is fun to remember those early days and to reflect on how far I’ve come since then. 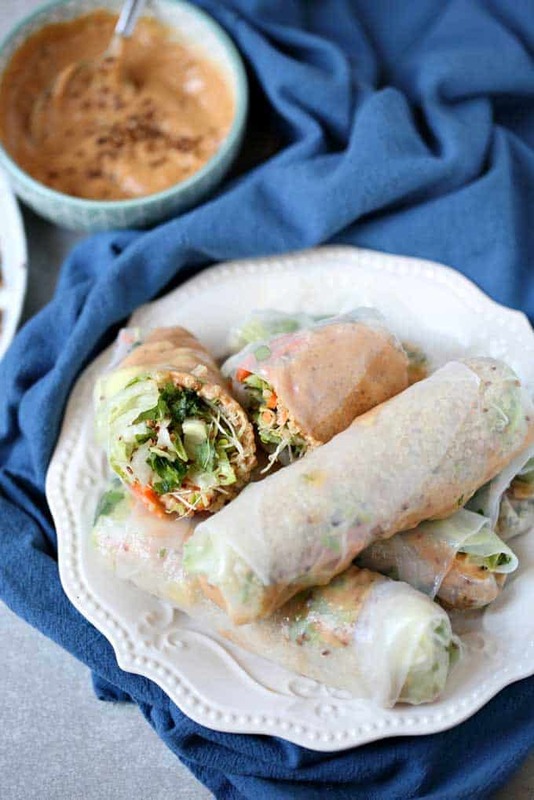 I don’t remember the circumstances around making all of the first recipes, but I do remember making these Quinoa Spring Rolls with Spicy Peanut Sauce. We were visiting my parents. The blog was still new, and I was anxious to get them on board with my new favorite food. My Dad has never been one to fuss much about food – he is typically just grateful when someone makes it for him. So, I wasn’t worried too much about him. My Mom, on the other hand, was very vocal about not liking quinoa. Not exactly what the daughter to someone with a little quinoa blog wants to hear. 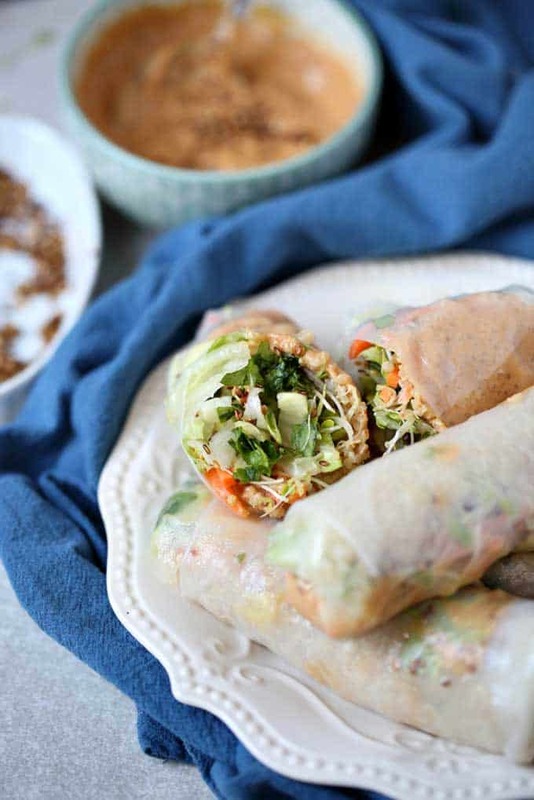 These Quinoa Spring Rolls were one of the first recipes that brought her around. 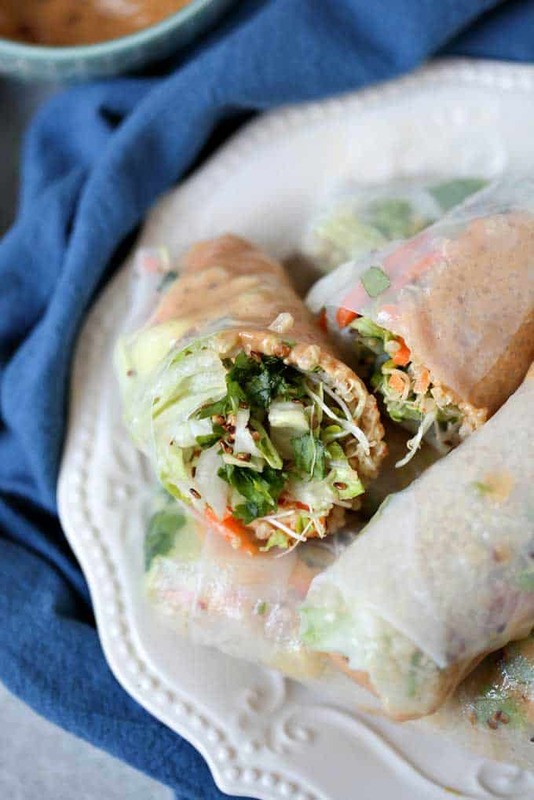 Truth be told, I had never made spring rolls before, and I was a little nervous about the process. What I should have been nervous about is making sure that by the time I got done making them, there were some Spring Rolls left to photograph. 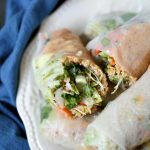 To this day, these Quinoa Spring Rolls still represent one of the most fun and unique quinoa recipes I’ve ever created. And now I know I need to hide some for myself so that they aren’t all gone before I can enjoy them. Working one at a time, soak wrappers in a large bowl of hot water for a few seconds and then transfer to a clean dry work surface. 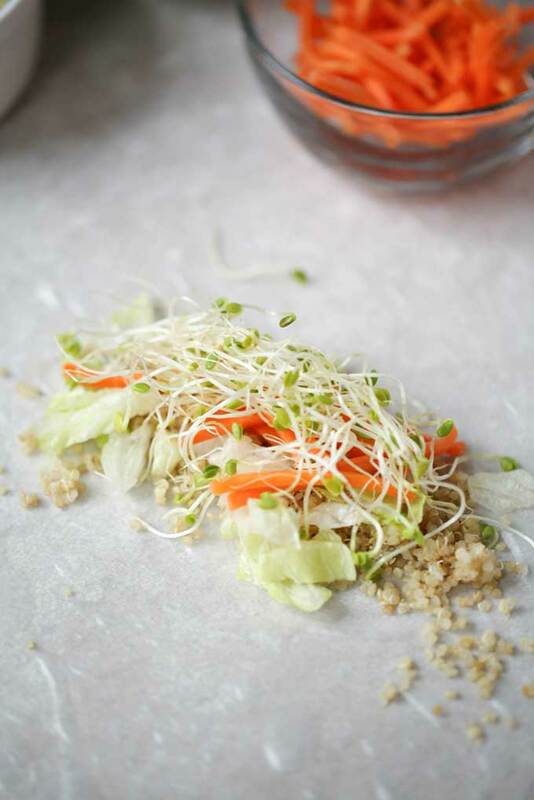 Place the quinoa across the right 1/3 of each wrapper. 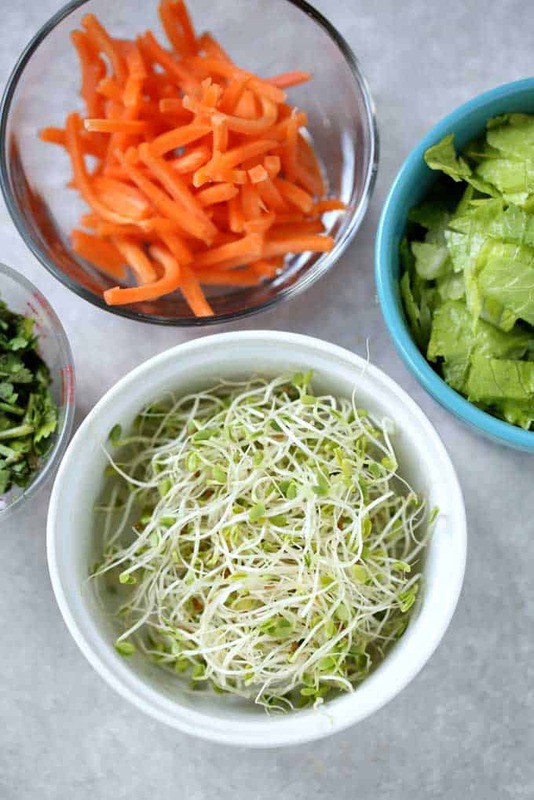 Top with lettuce, carrots, sprouts, cabbage, cilantro and basil. 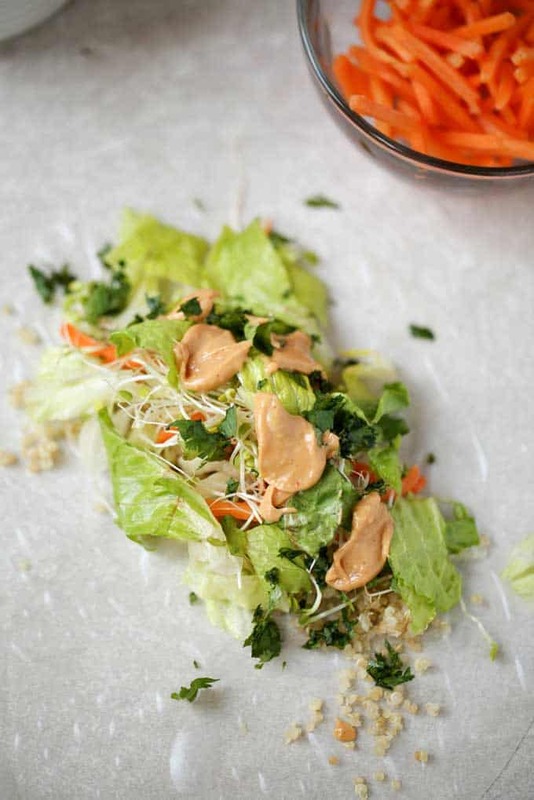 Add a tablespoon of sauce and sesame seeds and roll the wrapper tightly over the filling, tucking the ends in as you roll. 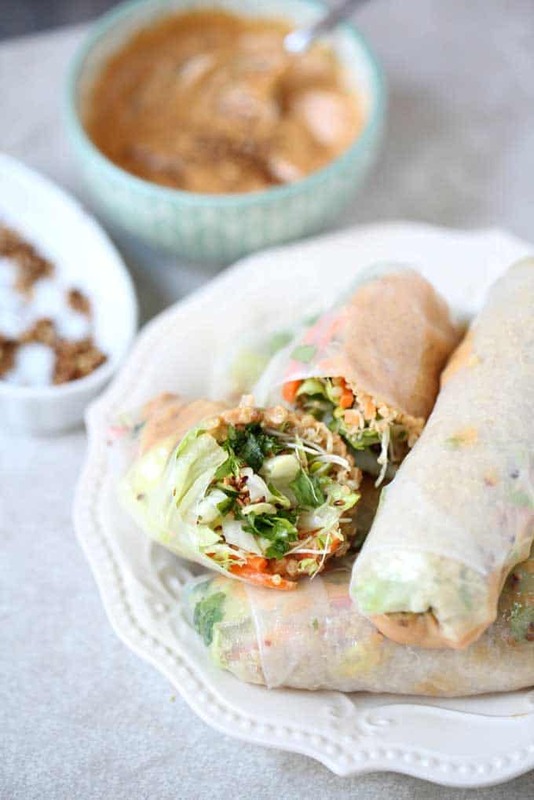 Cover with a lightly damp towel as you continue to make your rolls. When ready to serve cut in half and serve with additional sauce. 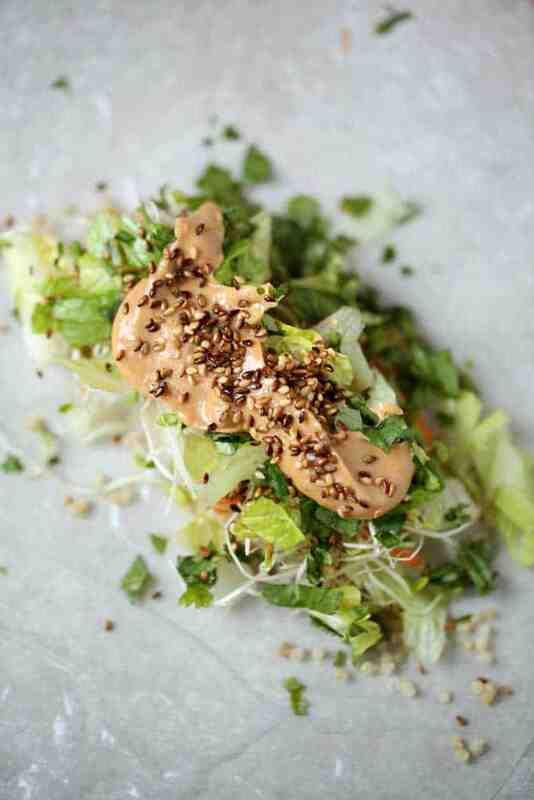 To make sauce combine all ingredients in a blender or food processor and process until smooth. Adjust seasonings to taste. 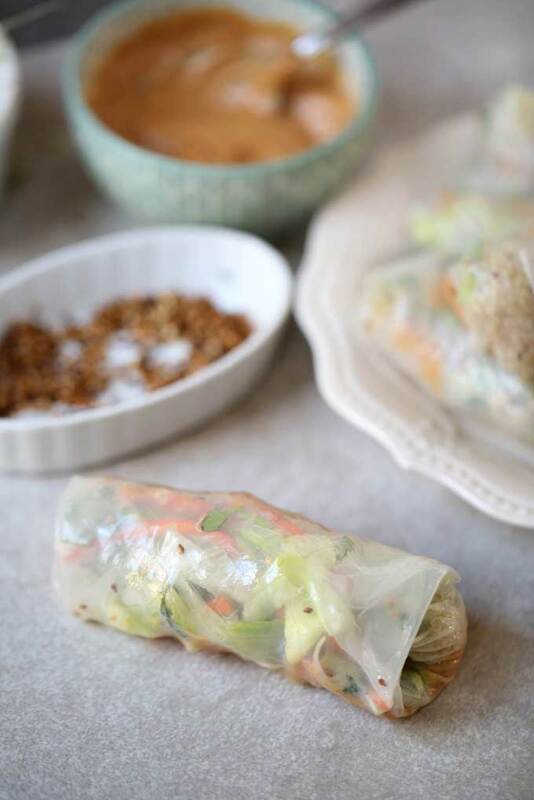 Do you have info/recommendations (even a brand) for the rice paper wrappers? I have Ranch 99 grocery stores near me so I’m sure I could find some there. Thanks! I don’t have a specific brand I use, but I have no issues finding them at the grocery store in the ethnic section.